Made of perforated, breathable, rubber-like neoprene, it provides stability and comfort. Is the DonJoy Sully right for me? Provides shoulder stabilization to post-injured shoulder. Can be worn while playing sports. Try our Brace Advisor for personalized product recommendations to meet your needs! The breathable, hook-sensitive neoprene vest grips the skin to allow precise placement of the donut-shaped foam pad. The hard-shelled foam pad helps protect the AC joint from further injury. Simply apply adhesive-backed hook to the foam pad to prevent migration. No restrictive and uncomfortable straps are necessary! On the inside the perforated, breathable, rubber-like neoprene grips the skin so the support moves with the athlete - it's as if the stabilization straps are attached directly to the body. Universal design fits both right and left shoulder. Comes complete with vest, pad and adhesive-backed hook material. Pad is also sold separately and can also be used with the Sully Shoulder Stabilizer. Perforated breathable, rubber-like neoprene material grips the skin so the brace moves with the athlete. Enables the brace to be used for shoulder separations. XS 34" - 40 " 9" - 10.5"
S 36" - 40" 11" - 13"
M 38" - 42" 13" - 15"
L 42" - 46" 14" - 17"
XL 46" - 51" 15" - 17"
can two be worn at the same time? one on the right and one on the left? No, you would need to have one custom made to be worn bilaterally. Please call 1-800-336-6569 to speak with the manufacturer to make this request. Unfortunately they do not have any shorter straps available for the brace. I am looking for a double shoulder stabilizer, do you sell any? We have the sully single shoulder but my son needs to protect both shoulders. Please contact DJO Global directly, they would be able to custom make the stabilizer. Please call 1-800-336-6569. Betterbraces.com does not carry replacement parts for the DonJoy Sully Shoulder Brace. Please contact the manufacturer at 800-336-6569. What is the best way to wash the Sully shoulder brace? We suggest you either hand wash in cold water with mild detergent, rinse well then lay flat to dry. You can also wash in the machine on the delicate cycle then lay flat to dry. Never place in the dryer. I measured out at 35' chest and a 10.5' bicep. I am worried that the brace might be too tight for me if I get a xs one. any suggestion? And also will this brace heal up my shoulder? I was diagnosed with a shoulder sprain and it's been bothering me for about 6 months. Also I am a boxer and I believe I injured my shoulder through weight training. I have right shoulder osteoarthritis and am a tennis player. Doc wants to do a total shoulder replacement. I have bee getting cortisone shots for 94 years with good pain relief. What brace would be best in light of my tennis. The Don Joy Sully will keep the shoulder warm and provide compression. If you want to restrict motion while playing tennis then this brace will do that as well. I separated my AC joint[ grade 3] about about a year and a half ago unfortunately i didn't rehab it properly and I'm still noticing pain while performing any pushing exercises in the gym. I noticed that i have a winged scapula with a slightly rounded shoulder.. My main concern is with this brace will help hold my shoulder in place to rebuild my stabilizer muscles.. also, will it help with the stability while performing bench press or any over the head presses ? thank you ! The Sully will provide compression to the shoulder and the straps are used to restrict shoulder motion. If restricting your shoulder prevents some of your pain then the Sully may be beneficial. I had surgery on August 25, 2015 for a torn labrum in 2 places. It was what they called a SLAP tear repair. They also did a bicep tendonesis where they cut my bicep tendon and reattached it to the front of the shoulder. I have finally been cleared to start lifting weights again, but even lifting light weight and more reps, I am still having a lot of soreness. I feel like if I had a brace that would provide compression and some stability it would really help. Is this the brave for me or do I need something different? The Sully can prevent the shoulder from moving into certain positions that may cause pain, so this may help with your lifting if you prevent extremem motion. I am a 50 year old man with rotator cuff tendinitis (technically tendonopathy). I have found that kinesiology tape helps with the pain. I've been going to PT for 3 months and had a cortisone shot. Progress has been slow and inconsistent. The doctor says my injury is relatively minor (tear is small), and my shoulder is stable and strong. They see a positive no surgical outcome,but the going's been tough. Would the brace be appropriate for me? Would it help reduce my pain? The DonJoy Sully Shoulder brace helps to prevent shoulder dislocation and other problems associated with shoulder joint instability. The brace will restrict motion depending on the strapping sequence to help keep the shoulder stable which may also decrease shoulder pain. I'm interested in buying the sully brace my chest is 45" measurement I'm 6'3" 215 pounds should I go with large or xl, I was thinking I probably would want a tight fit? You will need to measure the bicep as well and that should help you narrow it down. My son who is 17 had a 3rd degree separation during football and we are rehabbing it, but would like more support for his baseball and football workouts which would be the best brace. I have measured an athlete for a brace. He measures 41" across the chest and 12" in the affected shoulder's bicep. We are currently going through rehabilitation, and his contralateral bicep measures 12.5". Should we order a size small or size medium? The medium would be the best size. I am a baseball player and I constantly use my shoulder to throw. I have really bad scapular winging. What brace would help keep that stabilized? The Sully Shoulder Stabilizer has straps that can be attached to the vest to pull your shoulders down and try to pull the scapula down as well. I have had 4 anterior dislocations of my right shoulder in under a year and I'm scheduled for surgery in may. Most occurrences have been from upward impacts to the bottom of my arms when jumping off cliffs, whether its into water, foam pits, or snow. My arms are out to my sides as I am falling and when I land my right arm dislocates on impact. Will this brace help prevent my arm from these types of dislocations? I am in high school and the sport i play is Wrestling in the 285lbs weight class. i came into a match which had injured my shoulder. I have a subluxed shoulder and a small rip in my left rotater cup. will this brace help keep my shoulder in place while i wrestle? Unfortunately because the nature of wrestling , this brace will not be able to restrict that motion which your shoulder might either sublux or dislocate. I am not sure any shoulder immobilizer will be able to prevent this during wrestling. The Don Joy shoulder Stabilizer would have a better chance but I still not convinced that you will prevent an injury it your shoulder is forced into a bad position. The Sully can help your shoulder by preventing extreme motion of the shoulder. If your shoulder is painful after repetitively moving the arm in a certain way then this support will restrict that motion to help decrease pain. I have frozen shoulder will the brace help me. I am 32' around the chest and 8' around the bicep which is smaller than the xs. Will this make the brace less effective in preventing shoulder dislocations? Thank you for contacting Donjoy. Your measurements are below the standard size chart measurements. You will require a Custom Sully. Please contact Customer Care, they can provide you a Custom Sully Measurement form. Could this product assist in assisting me to throw is spite of having a rotator cuff tear? i need a prace to help with scapular stabilization and swelling in R shoulder and biceps area. will this brace help with pulling R shoulder and blade down and back in a better postural alignment? You could possibly use the Sully for this particular problem. the brace comes with neoprene straps that can be positioned to pull the scapula down. Hi. Ive been measured for a brace my chest is 41 1/4 and my bicep is 12 /5/12 inches. According to the size chart I'm right at the cusp of a medium/large. I would assume you would want it snug and not overly tight or loose. Just curious as to which route I should go? Thanks! Do brace fit either shoulder. I saw nowhere to select right, or left. Within the last year I had a total shoulder replacement. During the surgery my arm was broke just below where the rotator cuff muscles attach. P.T. was delayed because of the break for 6 weeks causing decreased mobility recovery. I play a lot of golf. I get a lot of soreness in this area causing even more lack of mobility. I think that part of golf problem is swinging outside of the comfort zone of my shoulder. Do you think that setting the straps to keep the motion within the comfort limits of my shoulder would help. Would the shoulder brace also help in eliminating the soreness and pain in the shoulder area? I use heating rubs in this area. Does the brace give you a heating sensation during activities? How does this brace work for tennis players. This would be for my left shoulder and I am left handed (i.e. my request shoulder). I am concerned about reduced range of motion. However, I think a brace would be helpful. When I do some of the rehab exercises if I support the back of the shoulder with my other (right hand) I eliminate the painful "clicking" that comes from behind the shoulder blade. Also, I take a size 54 jacket and wear 2xl tee shirts. I have very broad shoulders. I do not see a 2xl size. The xl seems only recommended up to 51". Any thoughts? I have dislocated my shoulder 3 times and i play varsity hockey but after visiting my doctor who is a specialist in shoulder dislocations he told me to pick up a sully shoulder support brace to continue playing contact but here you are referring to the shoulder stabilizer as the way to go for contact sports and i am just wondering if you can tell me what makes the shoulder stabilizer better for contact then the sully shoulder support ? My 17 year old son was just diagnosed (MRI) with large linear labral tear just a week before starting his senior year of basketball. Surgeon wants to do surgery immediately which will require him forfeiting his last year of basketball. He is looking for anyway to postpone surgery and play. Is the Sully a viable option to allow him to "play through" such an injury? My daughter is about 5'4" and 105/110lbs. She is a lacrosse goalie and has a torn labrum. We ordered the small Sully and that seemed too big. Now we're going to try the X-Small. On the Small it looked like there was a lot of room on the bicep and a bit of a wrinkle / fold on main portion (which I assume means it is too big). I just wanted to check if you have any other size option that I may be missing or if there is a strategy to getting it to fit right in the event the X-Small seems still too big. The brace size is based on a chest measurment and bicep measurement. There may be some room even on the smallest size. If the XS is still too big the only other option is to get one custum made and that would need to be doen through a DJO Sales rep. I'm recovering from shoulder surgery and still have a few more weeks to be in the Donjoy Ultrasling III - which I really like - great quality. After I'm out of the sling, I'd like some support and the Sully seems to be a good option. I work at a desk job - could the Sully be comfortably worn under dress shirts and look ok? I am in need of a shoulder brace to prevent anterior dislocation. I need to be able to wear it to play football. Im just not sure which in the best brace?? I play college baseball and dislocated my throwing shoulder 3 years after surgery on the same shoulder. I pitch and also play shortstop and hit for my college team. Which shoulder brace would be best suited for me to stabilize my throwing arm while pitching. Will this brace restrict me in any way from either pitching or hitting ? Hi, my son had surgery for a anterior labrum tear in December and is 17 playing high level soccer and is a goalkeeper. Since surgery his shoulder has come out twice. He is back in rehab to strengthen his shoulder and back muscles. Will the sully help him. The Sully is mad to prevent dislocations and subluxations, it will help him keep from dislocation his shoulder. I am a 56 year old female Bowler and i use a 13 lb ball. I have a torn rotator cuff. Will this brace help reduce the pain while bowling? My son has a slap 2 tear on the labrum. Will this help stabilize his shoulder for sports. Yes the Sully will help to stabilizer the shoulder. The straps can be adjusted to limit any motion that he may get pain and instability. my son has a slight AC separation. He plays offensive line. Which product will provide the best protection for his should while giving him the flexibility he needs? Both the Sully Shoulder Stabilizer and the DonJoy Shoulder Stabilizer will limit shoulder abduction but the Sully will most likley allow more because the brace and straps are neoprene so they will stretch. The DonJoy is a less flexible material, you may want to try the Sully. My daughter has a partially torn labrum and doesnt want surgery yet due to basketball. Her shoulder causes a lot of pain and is not very stable. I ordered the sully stabilizer but now after reading the comments maybe she would be better with just the sully support. What do you think? She plays point guard for her team. The Sully Shoulder Stabilizer is going to be the best support for your daughter. The support can be used for a vareity of shoulder instabilities depending on how the straps are used and the instructions that come with the support are very eay to understand on how to use the straps. another alternative is not to use the straps at all but just wear the support and it can restrict her movement somewhat. My 17 yr old son broke his collar bone last year. He had surgery and has a plate and six screws. He is a High School varsity QB and I need to know if there is something he can wear to protect his clavicle and still be able to throw. Will it get really hot to wear? I don't want to get uncomfortably hot while sweating during my sports. I'm really interested in this product so I want to know how it feels. Also is it uncomfortable to wear? Will this brace work for volleyball players too? And I would also need it for badminton so I need a full range of motion. But I also need it for basketball. Will this brace work for all of these sports? Thank you for your question. This brace would be appropriate for any individual who needs full range of motion during their activities. My 17 year old son recently had surgery to repair a torn labrum. I am trying to decide which would be best for him, the shoulder support or shoulder stabilizer. I have read the questions and answers and think we should get the support. He players football and baseball. He plays linebacker and wide receiver, that is why I am thinking the support will be best for him. Which would you suggest. Thank you for your question. Because your son needs range of motion to perform in his chosen sports the DonJoy Sully Shoulder Support would be the best choice for him. Do they make this in a double shoulder model? I was reading what others had asked to see if this might work with my shoulder/scapular injury, and on one answer to someone who asked specifically about winged scapula and associated nerve damage you said this brace would definitely help and was recommend. But another person asked about support for his shoulder blade, you said this brace "will not help or support the shoulder blade, just the rotator cuff." I am confused by the contradiction in answers. I have muscle weakness from nerve damage in my shoulder, a winging scapula and compensatory pain because I can't physically keep my scapula/shoulder aligned in the correct position (due to the muscle weakness). I am researching whether a brace would help by keeping the whole shoulder area supported. Since there are 2 opposing answers on here for similar questions, could you provide a clearer answer to the question of whether this brace would be appropriate for scapular support? Thank you for your question. The Sully is designed for shoulder instabilities associated with the rotator cuff. Because of the design of the vest, it will apply some compression to the scapula which may add some comfort and stability to the winging scapula you are experiencing. I have had dislocated my shoulder three times in the last year. Would this brace provide suitable protection for snowboarding and working out? The Sully Shoulder Stabilizer is indicated for those who have instability in the shoulder and comes with a set of straps that can be attached to protect multiple instabilities. This would be the best choice. I recently dislocated my shoulder swinging a golf club (i'm a righty and it was my left shoulder). Will this brace prevent (or at least significantly decrease the likelihood of) a repeat dislocation? Will it affect my swing substantially? The Sully Shoulder stabilizer will help to decrease the motion that puts you shoulder in danger of a re-injury. The straps can be applied for a variety of shoulder instabilities and you can pull the straps as tight as you need, so you can control how much motion you give yourself. My daughter is a cheerleader and is a base. She occasionally has shoulder pain. Will she be able to raise her hands above her head with this brace? She should if you do not use any of the straps to restrict motion. Thank you for your question. This would be the appropriate brace for your son. You will be able to adjust the desired range of motion and restrictions for his shoulder. Please call us or email if you have any further questions. I am a professional motocross racer. I've had 4 surgeries. I currently have a bone graph from my hip. I've had dislocation and instability problems. I need a brave that well provide support and be able to limit my range of motion with some padding. What brace well fit my needs best? The DonJoy Sully Shoulder support will give you support and padding. It comes with velcro straps that you will need to attach to prevent motion and you can get the AC pad as a accessory. The AC pd goes on top of the shoulder. I play baseball and i just suffered a significant tear in my labrum on my non throwing shoulder. This causes my shoulder to dislocate when I swing the bat. Will i be able to swing a bat with this brace on and not dislocate my shoulder? Also would i be able lift weights with this brace? The DonJoy Sully Shoulder Support will provide controlled range of motion for the shoulder. You will have the ability to play baseball as this brace is designed to stabilize, assist or restrict movement. Please feel free to contact us if you have any further question. I have a tendon tear in my Latissimus Dorsi musles as well as shoulder impingement. My Doctor does not reccomend surgery to repair the torn tendon and wants me to continue rehab on on my shoulder to reduce the impingement issue. This occured by playing to much golf. I want to continue to play and was wondering if the Don Joy Sully shoulder support would help me get me back on the course? The DonJoy Sully Shoulder support is designed for shoulder stabilization and to assist or restrict movements. Although the brace would offer compression to your injury it is not an indication of use for your specific injury. I would recommend contacting your physician and seeing if he thinks this brace would be a good option for you. Sorry I could not be of more assistance. We wish you a speedy recovery. I play football and i play defensive end. I have a torn labrel. Is this a good brace for that? And do you recommend it? If you are going to attempt to play with a torn labrum, I recommend the Donjoy Stabilizer. It provides the most support for Shoulder Dislocations. You are able to limit motion with this brace. I have dislocated my shoulder 9 times. I had a torn labrum and had a surgery to repair it. After the surgery it had continued to dislocate. Would The Sully be a good fit for me to use while I play soccer or would another be better? If you need maximum suport I recommend the Donjoy Shoulder Stabilizer, it is made up of stronger material, and provides more support than the Sully. The Sully is great for sports like volleybal, baseball etc., because it provides support but doesn't limit motion. If you would like to limit motion please try the Donjoy Shoulder Stabilizer. I had a Bankart Lesion 8 years ago and fix it with an arthroscopy. Last year riding my skate I felt (not hard at all) and I dislocated my shoulder again. I am also a snowboarder (advanced) and now I have no confidence on doing those sports. Which shoulder brace will be more apporpriated to my situation? I recommend the Shoulder Stabilizer it provides the most support, limits flexion and abduction. Which is the range where a shoulder will dislocate. See the link below. This past year during our homecoming football game i tore my labrum and dislocated my shoulder. Will this product help prevent another shoulder dislocation while playing football or should i find a different brace more suited for football? The Sully Shoulder Brace is best suited for Basketball,Baseball Players. For football players we recommend the Donjoy Shoulder Stabilizer, this brace limits Flexion, Abduction. You can adjust the restrictions by tightening the straps. We also have a shoudler kit available that can be screwed onto the Football Pads, instead of wearing the chest portion. The Shoulder Stabilizer is the best brace to protect your recent repaired Labrum. Please call to speak to a Product Specialist. 1-888-405-3251. I recently dislocated my shoulder playing rugby. I may not be playing rugby any longer, but I do plan on continuing soccer. I am not sure if I tore my labrum yet but regardless i plan on purchasing this brace. If i need surgery, would this be a good brace to use when I return to soccer? Yes, this is an appropriate brace for you to wear to support your injury during your desired activity. Can I wash my sully brace? I skateboard with it and it smells so bad! We recommend hand washing with a mild detergent and allowing to air dry. I have had bursectomy, spur removal subacromial decompression and a acomioclavicular joint exision. I am a keen wakeboarder and waterskier and would like to know if there is a product suitable for use in watersports for shoulder protection. The DonJoy Sully Shoulder is the most appropriate brace to stabilize your shoulder. It is made of neoprene, so it can be worn in the water during your activities. We recommend that you rinse the brace in tap water to make sure that no salt or chlorine remains on the brace and allow for it to air dry. How well would the brace work for Crossfit and olympic weight-lifting? I have osteoarthritis, which was the result of a rotator cuff and labral tear, and I'm hoping a brace like this might help with some of the popping. The Sully Shoulder Support is normally used for stabilization of the shoulder girdle. Many athletes wear it after shoulder dislocations and subluxations to prevent further occurances. While wearing the support, it will restrict your range of motion, so it's not something you would probalby wear while olympic lifting. It may help with some of the popping in your joint as usually shoulder motions are what cause the popping. If you have further quesitons on the product, we suggest you call our product specialist to further discuss at 888-405-3251. My son plays Free Safety and had shoulder dislocation I was wondering which shouldler brace would good for him to use? The DonJoy Sully Shoulder Support would be an excellent choice. Hi, I had a AC joint separation grade 3, one year ago, I want to practice jiu jitsu, wich would be the best protection and functional device? thanks. We offer the Chattanooga AC Sully which is what would be the best product for you. I get skin rashes with neoprene, is this available in alternate material? I have used Donjoy Drytex material in the past for knee brace and it worked a lot better. I am sorry but it is not. The drytex material is not velcro compatible, so the straps would not stay attached. You might try the Donjoy Stabilizing Shoulder. That is not made of neoprene. My 16 yo has a winged scapular (destabilization) and nerve damage. She is an avid sailor and sails most days all summer - which has irritated things. Orthopedist recommended rest between seasons and the Sully brace. Any idea how this would wear/work under a life jacket and with a trapese harness (worn to crew)? How much does it weight? The Sully brace would be a great option for your daughter. It is very light weight (~1-2lbs) and is very low profile and would fit under a lifejacket easily. My father had a stroke and is looking for a brace to support his shoulder. Would the sully brace help? The sully brace will help give some support and stability for his shoulder, especially if he has some subluxation and dislocation issues. I play corner back in football and would like to know if this brace would work for me? I need to be able to make interceptions and knock football down. And also tackle will this brace work for me!? Yes the Donjoy Sully Brace would be appropriate for you. Is this reccomended for a person with a bankart lesion? Yes this can be used with a patient with a Bankart Lesion. The Donjoy Shoulder Stabilizer would also be appropriate. The level and type of activity of the patient would be your determining factor between the two. If the patient needs to be able to raise his arm above his head the Sully would be appropriate. If that is not needed for his activity and mroe support is desired than the Donjoy Shoulder Stabilizer would be more appropriate. Is this brace good for a football player who was a bankart lesion? You can use this brace for a Bankart Lesion but his position would be more of a determining factor for which brace to use. If he is a lineman, line-backer, etc, a Donjoy Shoulder stabilizer would be better. If he is a skill position player the Sully would be better. After cutting the straps to length, how do you secure the Velcro to the strip? It sounds like you cut and trimmed the wrong end of the strap. One end has a sewn on velcro tab that should not be trimmed but rather, this is the section that is fixed first to the Sully Harness during application. The other end of the strap does not have velcro permamently attached to it, there are velcro tabs in the package sent with the product that you can add to that end to fix to the harness, therefore making it trimmable. I hope that helps. If not, please call us at 800-553-6019. Hi, I play rugby and had shoulder labrum surgery on my left shoulder. I also only have half of my glenoid fossa because it was fractured during previuos injuries. I've been playing with just an ordinary brace, however I'm looking for something more. Would the sully shoulder support help with reducing the chance of instability? Yes, the Sully shoulder brace will help decrease the instabilities and some range of motion in your shoulder, while still allowing you to be functional and participate in rugby. The Donjoy Sully Shoulder Stabilizer can be worn for an AC Separation for both Basketball and Wakeboarding. However, please check with your physician prior to resuming these activities with this product based on their treatment protocol and your specific injury. This brace looks ideal. But I barely fit the requirements for an Extra-small size. What if it's too big? I'll know it as soon as I unwrap it. Can I return it for a full credit (and not just for a store credit)? If your brace does not fit you or work properly for your needs, our no-risk, unconditional 90-Day Money Back Guarantee allows you ample time to see if your investment in your health is doing the job you expect and deserve. If, after trying the product within this time frame, you are not completely satisfied, you may exchange the item or return the product for a refund of the full purchase price (minus shipping & handling). I need to know what kind of shoulder brace to purchase. The doctor has said that my shoulder is worn out and replacement is needed but I am not ready. I would like to hold off awhile if I can. If you are looking for some light support and help with multidirectional instabilities, the DonJoy Sully is a great brace to help provide this support and stability while still allowing you to be functional through out the day. I dislocated my shoulder a couple years ago and opted not to have surgery at the time. My shoulder has dislocated several times since whenever making the motion I was making when I fist dislocated it. I was playing basketball and swatted down on a ball to make a strip, since from time to time when I make that same motion, sometimes acting on a resisting force, and couple times with no resistance force to act on, it has popped out. When this happens I simply lie down and it slides back in on its own. I still play basketball from time to time and every once in a while it will happen. There is not much swelling or pain associated with the dislocation anymore, which leads to my question. Will this brace help much? Or am I to the point where I need something with even more support? Or am I beyond a brace altogether? The DonJoy Sully Shoulder Support, will help provide you with shoulder stability and control of range of motion. This brace is used by many athletes to assist in their instability issues and still be able to participate in sport. You may want to check with your health care provider and see if he thinks that you need to do more than just a brace, or he may be able to give you some exercises to help strengthen your muscles. I have a torn rotator cuff and arthritis in the left shoulder blade. I also have a bad cervical spine.I am going to see a neurosugeon next week and am starting a job this week in a paint department. I will be lifting heavy buckets of paint. (about 30-45 pounds). Will this support brace give me enough support for this job? I know you probably can't give medical advise but will this brace be effective in supporting my back as well as my shoulder? Could you suggest something else that might work? This brace will not help or support the shoulder blade, only the rotator cuff. It will also not be able to support for the cervical spine. I seperated my shoulder a few times in my life from playing basketball. I have a slight torn labrel in my right shoulder. Will this should support brace help out from re dislocating my shoulder while playing basketball? The DonJoy Sully Shoulder Stabilizer will help provide you with controlled range of motion while being active. It is to stabilize and restrict motion of the shoulder, in the direction of your shoulder instabilities, while still allowing you to be active and participate in sports. My daughter has slightly elongated ligaments in her sholder and loves basketball, however occasionaly has pain do to the instability of her sholder. Would this support help? Also how do you measure the chest size, is it just below the bust for women, or across the bust? The DonJoy Sully Shoulder Stabilizer will help provide your daughter with controlled range of motion while being active. It is to stabilize and restrict motion of the shoulder, in the direction of her shoulder instabilities, while still allowing her to be active and participate in sports. This brace is a great option for basketball players. As far as measuring for a female you will want to measure her across her bust to get the optimal fit for her. Hand wash in mild detergent and Air Dry. I have had several shoulder sublaxations. My doctor says I have a partially torn labrum. I am in the middle of basketball season and have rested it for three weeks. Doctor says I can play again. Will this brace help my shoulder from coming out of socket. This brace will assist in preventing the shoulder from coming out of the socked, however you'll want to consult with your doctor to determine the best type of shoulder brace for your condition. My son is 13 and has dislocated his shoulder 3 times in the last year. He plays AAA Hockey which brace would be better suited for him the Sully or the Donjoy. He loves the game and it would be nice if he could still play at any level. I'd recommend the DonJoy Shoulder Stabilizer (https://www.betterbraces.com/donjoy-shoulder-stabilizer), as it will provide more support and protection. You may even be able to use the DonJoy Shoulder Stabilizer Shoulder Pad Attachment (SPA) (https://www.betterbraces.com/donjoy-shoulder-pad-attachment) to attach the Stabilizer to your son's pads. I'm a basketball player can I play wearing this, or is this for just wearing around? The DonJoy Sully Shoulder Support is designed to be used during play. I have had reconstruction of a torn rotator cuff twice. I have a very loose shoulder joint and I am a very agressive snowmobiler. I am looking for the proper stabilizer to aid in preventing dislocation. Being a female, it looks like all of the shoulder braces ride right across the breast area. ouch!! What would give me the best stability and comfort? Thanks. The DonJoy Sully Shoulder Support would be my recommendation. The material is more conforming than the DonJoy Shoulder Stabilizer. If you are looking for simply the best stability and comfort is less of a concern, I go with the DonJoy Shoulder Stabilizer. I play Wide Receiver in football and Outfield in baseball ... I suffered my first dislocated shoulder to my throwing arm. Once I am cleared to play (about a month or so more of therapy), will this brace protect against another dislocation? Also, will I be able to throw and swing a bat while wearing the brace? Will I be able to catch a pass over my head? Thank you very much for taking the time to answer my question. Will this brace protect against another dislocation? - The DonJoy Sully Shoulder Support will not prevent another dislocation, but it does lower the chances of it occurring again. Will I be able to throw and swing a bat while wearing the brace? - You will be able to swing and throw, however any support will hinder range of motion. Will I be able to catch a pass over my head? - Again yes, however any support will hinder range of motion. Because this is a light support, the hindrance will be significantly less than other shoulder supports. Thanks for visiting us at BetterBraces.com with your questions! my dad is 81 years old and has a bad rotator cuff. He thinks he is too old for surgery and I kind of agree, with rehab up to six months, for him it would be a little much. 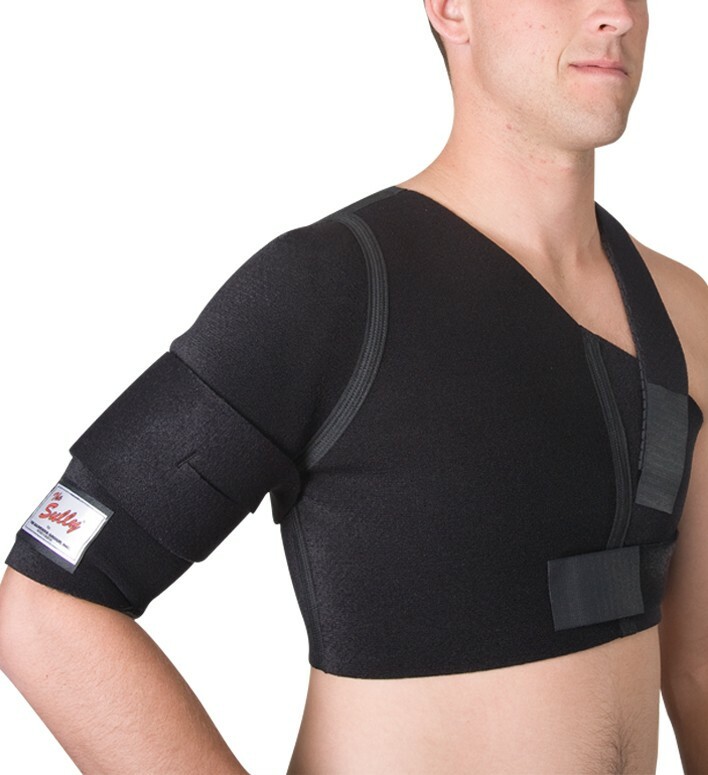 Would this Sully shoulder brace help relieve some of the pain he has when he moves quickly. Also , he loves to fish and would this help? This brace is fairly easy to get on and off so it should work well for your father. It will provide some nice support and stability to his shoulder and the warmth of the material will ease some pain as well. Fishing and other light activities should be just fine in this shoulder brace. Will this brace work well for shoulder dislocation and instability? Will this brace work well for baseball? Can you throw and catch freely or does it restrict your movement extensively. This shoulder brace is intended for shoulder dislocation and should instability. It will help stabilize the shoulder and reduce the risk of shoulder dislocation, but it is by no means going to provide absolute protection as with any shoulder brace of this kind. Since the brace is made out of neoprene it is stretchy and will work well for baseball. You can control the amount of support or limit your range of motion with the strapping system as well. You should be able to move fairly normally in the brace, but keep in mind that in order to stabilize and protect your shoulder the brace needs to limit some range of motion. I purchased for my son who plays hockey and had a recent shoulder dislocation. Appears to be well made and does not overly restrict mobility. Fits nicely under the shoulder pads. The bicep sleeve does seem to cut off circulation a bit but should be fine for game situations. Pricey for what you get. I bought this brace for my son, who had a bankart repair surgery and had subsequent dislocations. My son likes to downhill ski and this brace provided him the support he needed to be able to ski and enjoy himself while he waits to have his second surgery. Pros: Holds shoulder in place and provides great support. It is somewhat expensive, but worth every penny. This allows me to play basketball without feeling like I am going to have my shoulder fly out of its socket and lead to another 2 months of sleeping on my left side, because my right side is painfully tender and healing after dislocating. The Sully is AMAZING, but my shoulder is not. I wish I found this thing sooner, because I'd done too much damage by the time I found The Sully. I should be wearing this playing ANY sports, because despite being a basketball player by nature, I decided to hop in as goaltender during a soccer game without my brace. I hit the dirt sliding out at someone and landed on my right elbow, and my shoulder popped out of its socket as bad as if it was the first time. That injury was post-surgery, and it ruined my ability to play sports for awhile. I'd long since lost the first Sully I'd purchased while playing varsity basketball, but now that the injury has happened again, I knew that I would keep playing sports and needed to embrace the brace that let me do so without worry. While it wasn't easy to get my package to my house because of a shipping error (MY fault, not Better Braces), the Better Braces customer service team were INCREDIBLE. They went the full 9 yards in helping me receive my package, and the agent I'd spoken with - Janine - even went as far as to email me afterward to check in on things. The Sully is not cheap, but if you need your arm to stay in place and want to play competitive sports without padding, it's your best bet. This is also a STELLAR place to pick one up from. I highly recommend purchasing from Better Braces because you're getting a damn good price on this product, as well as potentially working with a superb customer service team. I have been using this brace for the past 2 years. I had dislocated my shoulder 4 times playing roller derby. I will say, that even with the brace on, I have still dislocated my shoulder (4 more times), but the dislocation has been much less severe. I like that I can change where the straps are depending on where the pain is in my shoulder. I would definitely recommend this product for those with recurring shoulder dislocations. Good stability brace, but expensive. I purchased this brace for my son who dislocated his shoulder playing hockey. He finds the brace gives a sense of security and confidence on the ice. I bought this for my son who plays high school soccer after he had strained it while playing. Luckily there was no break, but he had weakness and swelling. The brace allowed him to have the necessary support to play. The instructions were easy to use to get the right size and the shipping was fast. Cons: Some wear on the brace even though have been using for about a month.